Edie was diagnosed with stage 4 gallbladder cancer and went through extreme chemotherapy and surgery to rid herself of the cancer. After being given an all clear five years later, Edie determines to walk the old California Mission Trail, a length of 800 miles. She does it with the help of friends. Two years later the cancer is back. This time her dream is to walk the rest of the trail that goes down into Mexico, the El Camino Real Trail, another 800 miles of mission trail. If she accomplishes this, she would be the first person since the Franciscan Father Junipero Serra walked the 1600 miles in the 1770s. This second 800 miles is no walk in the park. There is virtually no trail, she has to have a vaquero or guide for the entire trip and is constantly changing guides. Some of them know the trail well and others lead her needlessly in wrong directions. Finally, 38 miles from the end of the trail, Christmas is a few days away, and a PET scan a few days after that and so she gets a ride to the border. She determines to come back and finish the trail at a later date. And that is where the book ends. I don't know what has happened to her cancer or whether she came back and finished the trail. She wrote the book, so I'm assuming she beat cancer again and also walked the trail, but the book doesn't tell us that. That's sort of sad, though I'm sure if you searched the world wide web, I'm sure you could find out more information. It's a fascinating story of her extreme struggle to survive both the cancer and then later the El Camino Real trail. I have to admire the sense of adventure and the strong determination that Edie displayed. I don't think I would have it in me to endure what she did just to walk the trail. 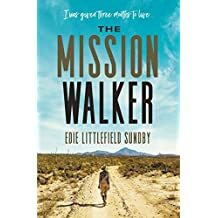 I just finished The Mission Walker by EL Sundby and was totally moved by the book, the story of the walk and the determination to live life. How is Edie doing today?